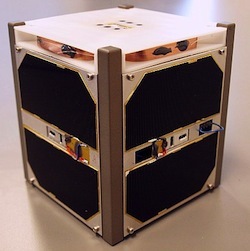 Information about the danish Aalborg University cubesat development. 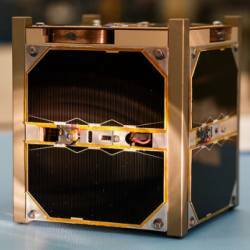 AAUSAT3 is the third CubeSat built and operated by students from Aalborg University in Denmark. It will be launched from Satish Dhawan Space Centre in India on a PSLV-20 rocket. AAUSAT3 carries two AIS receivers as the main payload. Main test area will be around Greenland due to the low density of ships and the cooperation with our main sponsor Danish Maritime Authority. AAUSAT3 will – hopefully – be capable of receiving AIS information and carry out on-line information analysis. Still the full AIS telegrams (the HDLC package) are stored on-board and can be downloaded. Partially damaged telegrams will be stored as well (given a number of restrictions/rules) for later repairing in the ground segment. So weak signals (like from SART equipment) may be receive-able by AAUSAT3. Launched 25-feb-2013 at 12:30 UTC and active. The spacelink frames start with a variable length training sequence (default 60 bytes), followed by a 6 byte syncword (“OZ3CUB”). The packet format supports two different packet lengths, either 25 or 86 bytes. A one byte Frame Size Marker (FSM) is used to differentiate between long and short packets. The FSM is 0xA6 for short frames and 0x59 for long frames. Below a reception overview made at 09-10-2015 19:10 UTC. The GMSK beacons are transmitted every 45 seconds.